about what a bike shop can be. 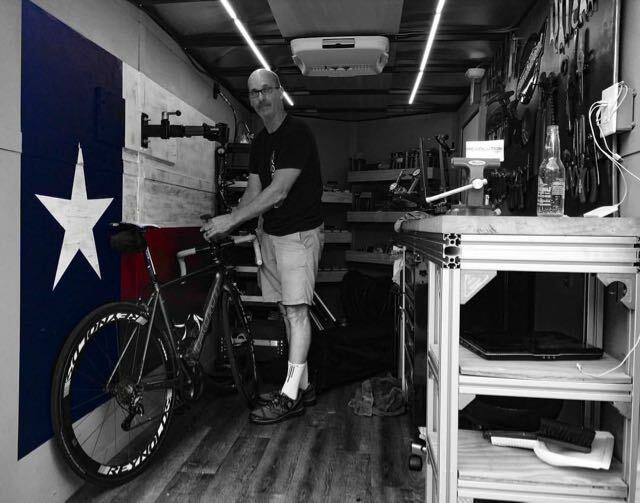 Our mobile bike shop covers all of Travis, Williamson, and Northern Hays Counties. Drew basically rebuilt the bike from scratch in 1 day. He dropped it off at my house yesterday and on my first ride today the bike was quieter and smoother than it has ever been. I’ve always loved this bike, but now the bike is perfect and I’ve never been happier with it. Booked an appointment at 11 pm on a Tues and Drew showed up the next day and serviced 2 bikes quickly and with such attention to detail. This service couldn’t be easier or faster (and it is very reasonably priced). Being able to have Drew come to the house and get my bikes ready for tri season while I took conference calls and worked was fantastic. The service was top-notch and affordable and I didn’t even have to spend one minute in traffic! Great tune up from Revolution Mobile Bike today. Drew has my ride running smooth as silk and you can’t beat the home service! Never leave your bike at the shop again. No more hauling your bike to and from the shop. Avoid the wait times and the stress of missing that next ride. Easy online booking, email reminders prior to your appointment, and free consultation on any work or upgrades your are considering. Shimano certifications, 6+ years of repair experience ensures you are in good hands. End the Cat 5 Tattoo! See a full list of services offered on the services page.